Have you always felt a little drawn to the Italian countryside, and the idea of making your way through breathtaking landscapes on one of their characteristic scooters? Can you almost feel the wind against your face as you picture it? If the answer is yes – then this modern take on a beloved classic might be just what you are looking for! This top-rated electric scooter will take you where you need to go with style, efficiency, and comfort, and if you are lucky – it might even give you a little taste of Italy when you head off for work or down to the supermarket. It is classy looking, powerful, sturdy and with the capacity to take you far on a single charge, and it is lightweight enough to be safe to use regardless of physical strength and/or abilities. See more top-rated Razor scooters here. This gorgeously designed electric scooter takes you on rides that can last for up to 70 minutes (of continuous use) on one single charge, thanks to the powerful 36V (3x12V) sealed lead acid battery, which is rechargeable with the included charger. Bring the charger along with you when you go for a longer ride, so that you can charge up the scooter while having a cup of coffee with a friend or while working! That way you will never run out of battery power and can continue going and going for as long as you would like. The maximum speed is 16mph (26km/h), and the chain-driven 500W motor is both high-torque and self-adjusting. Such speed is about as much as you can expect to get out of an electric scooter without having to have a license to use it, and it will take you places at a safe- yet efficient speed no matter the weather conditions. 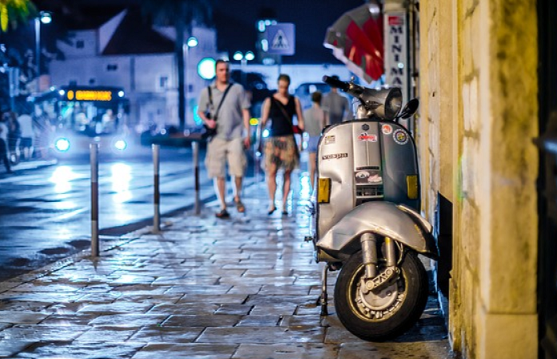 Once you get on it, you will quickly realize that it is the perfect speed for cruising around, and you can also choose to go slower since the scooter has several lower speeds available as well. Looking at the wheels, they come with 16” pneumatic tires, which are resistant and unlikely to go flat. This provides an additional safety feature, and they are apt for driving on many different surfaces such as gravel, grass and unpaved roads. You do need to be careful with large sticks and similar that could get caught in the chain, but other than that – this electric scooter will provide safe transport on most surfaces. Another safety detail is the hand-operated, dual-disc rear brake, and the variable speed option which is controlled with the twist-grip throttle. Some electric scooters will only go at one speed, but this one here can be maxed up to 16mph, yet it can also go slower and be put to a halt rather fast with the rear brake if needed. It is always important to respect traffic rules and regulations if driving on roads, regardless of how fast or slow you go. The scooter has soft rubber grips for ultimate comfort, which allows you to hold on firmly to the handlebar also on rainy days or on days with less favorable weather conditions. Every good electric scooter needs a storage compartment for items such as a bag, a jacket or a spare change of clothes, and this product here has it conveniently under the seat. Just lift up the seat, put whatever you need to bring with you on the ride in the hidden compartment, close it up and get going! When you want to take a break you simply use the center-mounted kickstand to leave your electric scooter wherever you see fit, so that you can stop, take that jacket out from the compartment under the seat on a chilly day, and then get right back on the road again. 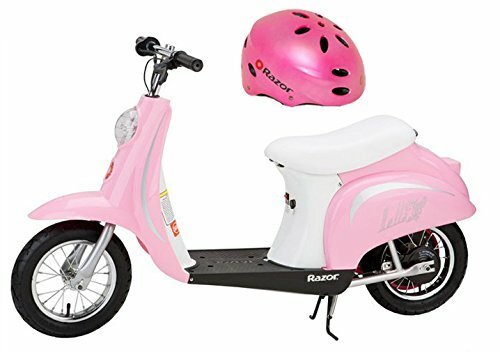 This electric scooter is recommended for children, teens, and adults over the age of 14, which has to do with the responsibility that comes with driving this type of electric scooter. Since it can reach a maximum speed of 16mph, it is not suitable for small children due to the risk of injury, but it can be used by responsible kids under adult supervision. Always have children wear a helmet, and never allow them to use the scooter on their own, or on trafficked roads. A better idea for young kids is to allow them to take a ride with you, by standing in front of you between your legs and holding onto the handlebar. The Razor Pocket electric scooter is also a great option for older people, as it can help someone with walking difficulties to get to where they need to go without much effort. Everyone deserves to feel independent, and this scooter is a great asset to make sure that the independence can last longer. 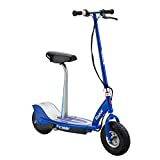 It only weighs 75lbs, which is not much for the type of scooter it is, and it makes it easy to manage also for someone who might not have a lot of physical strength. Take it downtown for a coffee with friends, drive it to a doctor’s appointment or when going grocery shopping! It can carry a smaller bag of items in the compartment under the seat, and the charge lasts long enough for it not to have to be recharged before getting back home. The maximum weight limit for this scooter is 220lbs, which is the total weight that can safely be transported on it. This means that if you choose to let a child ride with you, the total weight of the two cannot be more than 220lbs. This is a safety regulation that should not be ignored, both for the wellbeing of the riders and for the sake of the product. 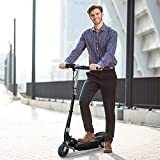 This electric scooter is perfectly suited for anyone who has the maturity to use it in a safe way; who is aware of basic rules and driving regulations and who can master the 16mph speed in a responsible manner. It is great for teenagers who need to get to school, for adults as an environmentally friendly way of getting to work and for older individuals who might no longer be able to walk long distances. The unique and charming design of this durable electric scooter is what stands out the most, and it will make any short trip a lot more fun. For someone who has always wanted that Italian feel of driving down a country road on a scooter – this is the product to consider. It may have that irresistible vintage look, but it also has all the modern features needed to make it a strong contender for an individual with a need for an electric scooter. It charges fast, which means it can easily be charged up for a couple of hours while engaging in some other activity, and it can go for a whole 70 minutes on one single charge (which is significantly more than many of its competitors). This is very convenient when wanting to use it when living somewhat remote since you want your electric scooter to last the whole way to your destination. The powerful battery, which is, in reality, three separate batteries, last through hundreds of recharges, making it a great option for someone who is hoping to use their electric scooter for a very long time without having to switch out the battery. We also like that it has several different speeds, and not just one. This means that you can drive slower when required and hit max speed at your own convenience. It can take some getting used to before you feel completely comfortable regulating the speed of the scooter, but it is overall very user-friendly and easy to get accustomed to. It is the perfect option when wanting to be a bit more environmentally aware, and it can be a great asset for anyone who is looking to move around the city or down country roads without having to drive or take the bus. It is also the ultimate training tool for a teenager before he or she is old enough to get a driver’s license, as it can teach them valuable lessons about being on the road while also getting them to where they need to go.